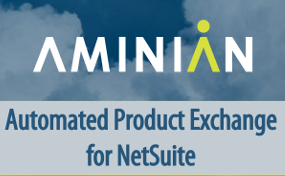 Aminian’s Automated Product Exchange SuiteApp automates the product exchange process within NetSuite, reducing the time and resources associated with managing product exchanges by automatically creating and processing replacement orders, invoices, and credit memos that corresponds to a selected return merchandise authorizations (RMAs). Ideal for businesses with a large number of replacement orders, the Automated Product Exchange SuiteApp streamlines time-consuming accounting processes and allows all product returns to be easily managed in your NetSuite account. Standardize your product exchange processes and boost employee productivity with our customizable NetSuite solution. At Aminian Business Services, we take pride in having designed and implemented a number of projects for customers who were seeking solutions that are not available in a NetSuite “out-of-the-box” configuration. Our applications and extensions seamlessly integrate with NetSuite’s free product upgrades, making IT nightmares a thing of the past. Contact us today to discover how our seasoned staff can customize end-to-end business processes to your precise business requirements. The Automated Product Exchange SuiteApp provides the ability to automatically process product exchanges inside NetSuite. This provides increased efficiency, reduces errors, and ensures that the product exchange process begins and ends within your NetSuite account. With just the click of a button, the Automated Product Exchange SuiteApp creates a replacement order from an existing RMA. All automatically created replacement orders are pre-populated with all relevant customer, contact, and product information. With the Automated Product Exchange SuiteApp, credit memos are automatically created and reconciled with replacement orders, increasing business efficiency and eliminating costly errors. The Automated Product Exchange SuiteApp processes a replacement order invoices and credit memos, preserving the item’s average selling price and eliminating the manual work of reconciling credit memos with invoices. Data from all automatically processed product exchanges is saved in the customer record and transaction record inside your NetSuite account for future tracking and reporting. your Netsuite and/or business needs.